Photo of Delaware County Child Support Enforcement Agency Director Joyce Bowens (at podium) and members of the CSEA team as they met with the Delaware County Board of Commissioners on Jan. 14, 2019. DELAWARE, Ohio – Today in session, the Delaware County Commissioners recognized the County’s Child Support Enforcement Agency for the awards it recently received from the State of Ohio’s Office of Child Support. Additionally, Bowens noted that the Delaware County’s Total Disbursement per Total Full-Time Equivalent Employee, which is a measure of cost effectiveness, was $18.56. Translated, this means that in 2018 the Delaware County CSEA collected $18.56 for every dollar it spent. By comparison, Bowens said, the state average last year for all caseload-size divisions was approximately $4.50. The Delaware County Board of Commissioners is deeply saddened to report that our colleague Scott Amrine passed away yesterday (Jan. 9) while at work. Scott was a valued member of our Facilities Management team. He was 44 years old, a resident of Delaware and had been a maintenance specialist with the County since 2016. Through his work, Scott was able to impact and interact with many departments in the County and we are making available a crisis counselor for our employees. We extend our heartfelt condolences to Scott’s family and to all his colleagues, who will miss him greatly. Because his passing occurred at the workplace, we are committed to conducting a thorough review of the circumstances. 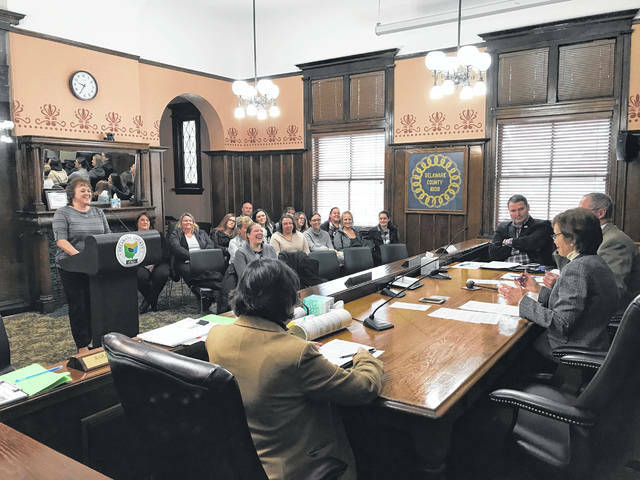 DELAWARE, Ohio – The Delaware County Board of Commissioners today (Dec. 20) approved its budget for 2019. The $113,275,365 figure approved for General Fund expenditures increases operating expenditures by 4.3 percent over 2018 levels. This increase will allow for some modest increases in staffing and a 3.0 percent raise in salaries for non-union employees. Today (Dec. 27) in session, the Delaware County Commissioners voted to reject the bids received in October for the Old Delaware County Jail and surrounding land. Instead, the County will now negotiate the potential transfer of this historic building, located at 20 W. Central Ave., to the Delaware County Land Reutilization Corporation, which in turn will be able to negotiate with potential buyers. A land-reutilization corporation, often referred to as a “land bank,” is a public entity that is best known for helping communities return abandoned or blighted properties to productive use. But state law also enables the counties that have established land banks to transfer property they own to those land banks for sale and redevelopment. A land bank’s statutory powers provide it “with a greater array of tools to negotiate with a wider pool of buyers,” explained Brad Lutz, Delaware County’s Director of Business Operations and Financial Management, who will represent the Commissioners in negotiations with the DCLRC. Lutz said the Old Jail, which dates from 1878, could be sold to the DCLRC for a dollar amount. The DCLRC would then be able to seek a buyer for the site. Part of the rationale for pursuing the land-bank option, Lutz said, is that the DCLRC has broader powers than the County in negotiating and setting terms for the sale and repurposing of the property. The County, Lutz said, was limited to consideration of “straight price” in evaluating bids. This is the second round of bidding that the Commissioners have voted to reject. The first round in May attracted two bids, the highest of which was from a local law firm for $156,000 to create legal offices. The second round in October attracted four bids but also included additional parcels of land on Court Street: That round attracted a high bid of $183,500 from Columbus developer Connect Realty for a mixed-use proposal. Lutz also emphasized that, with this new phase, only the Old Jail and surrounding land would be included in the discussions with the DCLRC. If the transfer is completed, the previous bidders would be able to work with the DCLRC if they are still interested. For more information about the Delaware County Land Reutilization Corporation, go to https://co.delaware.oh.us/wp-content/uploads/2018/01/12_28_17.pdf (Resolution 17-1364). Work has begun to convert Marshall Court to a pedestrian-only area. The short roadway, which runs from North Sandusky Street to North Union Street, separates the Delaware County Courthouse and the Rutherford B. Hayes Administrative Building. The project is part of ongoing improvements to the County government’s facilities. “It’s a safety issue as much as a way-finding issue,” said Jon Melvin, the County’s Director of Facilities Management. With the closure, emergency vehicles will be able to access the area as needed, while pedestrians will be able to move freely between the two buildings. Non-emergency vehicles will not be permitted to drive through the area. Decker Construction Company of Columbus was awarded the $55,120.38 contract on Dec. 13 to build a curb and sidewalk along North Sandusky Street. It is anticipated the work will be completed within two weeks. This closure also precedes the upcoming changes to addresses for the Courthouse and the Hayes Building. Beginning Jan. 1, 2019, the Courthouse’s address will change to 117 N. Union St. (from 110 N. Sandusky St.) and the Hayes Building’s address will change to 145 N. Union St. (from 140 N. Sandusky St.). These changes reflect the fact that the main entrances and parking areas for those buildings face North Union Street. It will also make it easier for online mapping tools to help drivers and pedestrians find the buildings. https://www.sunburynews.com/wp-content/uploads/sites/48/2019/01/web1_19-01-14-DelCo-CSEA-honored-by-Commissioners.jpgPhoto of Delaware County Child Support Enforcement Agency Director Joyce Bowens (at podium) and members of the CSEA team as they met with the Delaware County Board of Commissioners on Jan. 14, 2019.